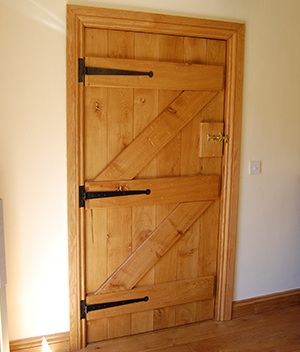 The Barn doors can be Ledge and Brace or Ledged only and is the perfect solution for your barn conversion or cottage, and because of the warmth and beauty of solid oak ledge Barn doors will look equally as good in a modern style house. We are highly skilled to provide our consumers with quality designs and patterns to Solid Ledge Barn Doors adding an aesthetic and elegant touch to home area. Our workshop is fully equipped to the customized manufacturing of doors and panels with relative accessories. We have a group of skilled engineers working to develop some of the best imprints bespoke barn doors perfectly certified to PEFC European Kiln grade. Get an exclusive option to V groove or beaded style doors immensely suited to the interiors of your place. All the fixtures are duly inspected to surpass the quality check before dispatching. Feel free to make your choice to sanded or unfinished barn doors fully customized with accessories subjecting to ironmongery, latch blocks, architrave, linings or skirting that gives enhanced look to the area.